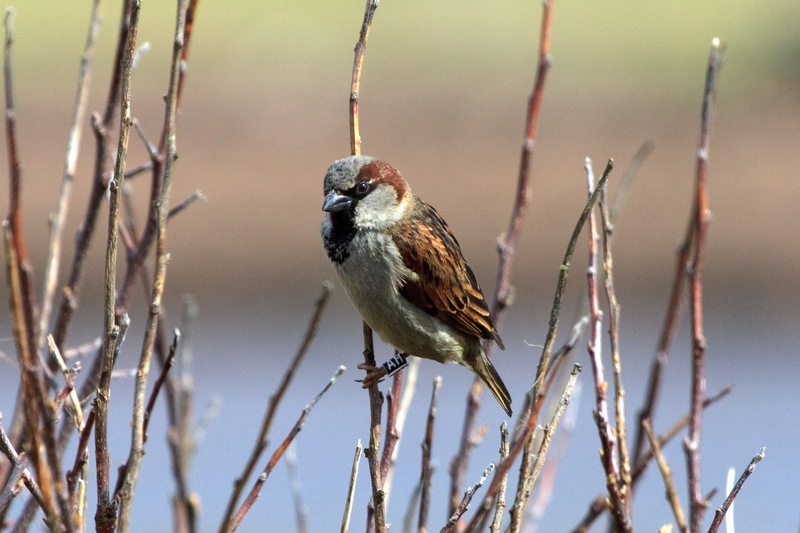 A project to study the status of House Sparrows (Passer domesticus) in the Shetland Islands, UK. 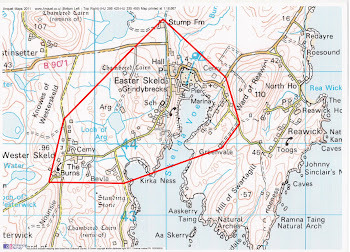 Primarily monitoring a probable isolated population on the Westside of Mainland Shetland, around the village of Skeld. We have consulted with the British Trust for Ornithology, who actively encourage the monitoring of Red List species such as the House Sparrow, and this project had been registered with them as a Retrapping Adults for Survival (RAS) scheme, using ringing and colour-ringing birds to enable them to be individually identified by bird ringers, birdwatchers, or members of the public.The birds are captured (under licence) and are fitted with a BTO metal ring on their right leg, and with a colour ring on the left leg. The colour ring has a code (the rings are Black, with White lettering, and the code is 2 digits either numbers or letters) that can be easily read using binoculars. 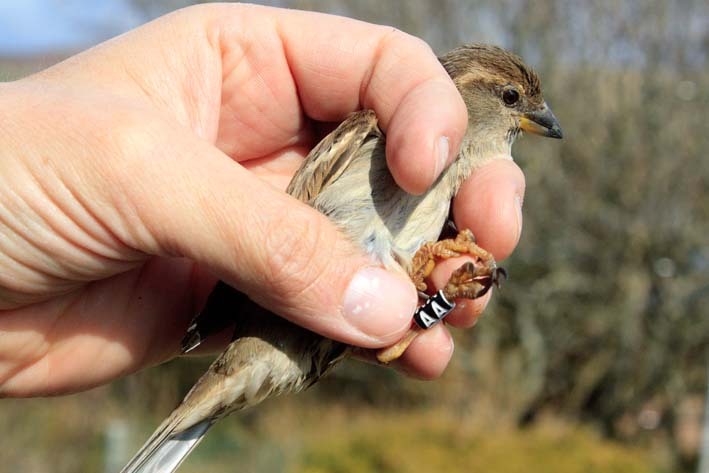 Anybody seeing a House Sparrow with a colour ring can contact us at shetlandsparrows@gmail.com. We need to know the code on the ring, and the date and place you saw it. Many thanks for your help! Well, I'm about half way through the breeding season and catching/ringing effort for the first year of my House Sparrow RAS (Retrapping Adults for Survival) here in Skeld, Shetland. So far, 43 birds have been colour-ringed, and there are now lots of juveniles out and about here. The advantages of colour-ringing are already becoming evident, with 47 resightings so far. The other great news is that it are also very large numbers of unringed birds still here in Skeld. An hour watching the feeders in the garden may reveal say 10 colour-ringed birds, and at any one time another 20-30 unringed birds, so there could easily be 150+ more birds to catch/ring. And more and more juveniles are appearing every day, so it looks like a really healthy population! It's great to get people involved in a project such as this, and thanks to the Shetland Times and BBC Radio Shetland local people are now showing an interest. I've been asked by the primary school in Skeld if I'll give a talk to their pupils as they want to have a go at resighting birds. All this is amazing news! Today I opened the nets for a short period and in popped three more House Sparrows, two females and one male. Interestingly, both females have brood patches (as they should by now), so they are definitely nesting somewhere nearby. Also, I'm getting more resightings of colour-ringed birds in my own garden now, which is promising, with the earliest ringed bird that's revisted (while I've been watching!) being AC. No sign yet of AA or AB! Just about to close the nets down when a Robin popped in. Now in Shetland Robins are fairly exciting at the best of times, but my heart started racing as I saw that this individual was already ringed - No, I haven't ringed any here in Skeld. I extracted the bird then checked the ring - below the ring number was written 'Stavanger Mus. Norway'! A bit of hop across the North Sea then for this healthy bird. 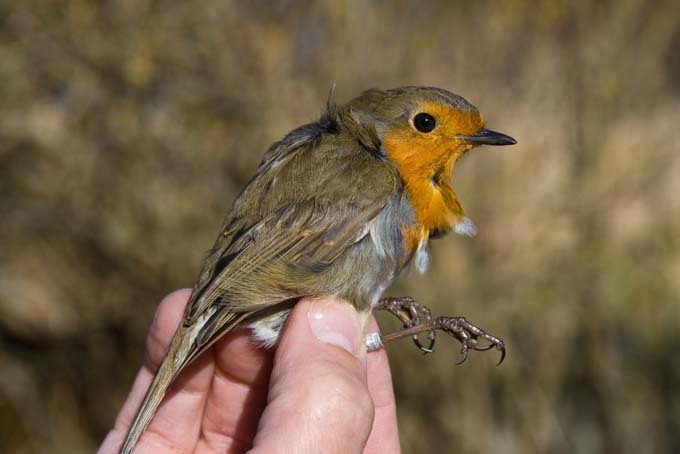 The Norwegian Robin in Shetland! Yes, the Shetland House Sparrow Project is officially up and running! Yesterday we opened the nets in Skeld for half an hour, and caught a female, closely followed by a male. These were ringed with a BTO metal ring on the right leg, and a colour-ring on the left. The female now wears a black ring with AA engraved in white, and the male sports black with AB! A Starling was also caught and ringed. Today, another short session at the net, and the 3rd spadger of the project was soon caught and ringed. Another male - he has become AC. Well, everything seems to have happened at once with this project. We now have the project registered with the BTO as both a Retrapping Adults for Survival (RAS) project, and also as a colour-ring project, so we are almost ready to start. I say almost, because I am now in the process of moving house to the nearby village of Skeld. There's a very healthy population of House Sparrows in Skeld too, so it makes sense to focus our ringing attentions there, rather than in Walls. Everyone concerned now knows that we have moved our research area to Skeld (see map to the left). The BTO have asked that the colour-ring part of the project start with just two-digits for the code, rather than three. So initially the rings will be Black, with White engraving, using alpha-numeric code as two digits. The other great news is that we now also have funding from the Shetland Wildlife Fund to pay for the colour rings! So, the rings are ordered, and once they arrive from Poland we'll be ready to go. Yes, it's official. 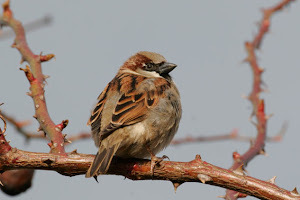 Thanks to Allison Kew at the BTO my House Sparrow RAS application has been passed, so once the colour-ring project has gone through the system we'll be up and running with this. Well, the wind eased today, despite the cold and snow-showery weather, so I took a gamble and put up a 12m net in the back garden here in Walls. 3 House Sparrows - all female, and all newly ringed today. 5 Starling - 4 of them newly ringed, the other a female first ringed here 100 days ago today. 3 Blackbirds - 2 males newly ringed today, the other a female first ringed on 15th January. 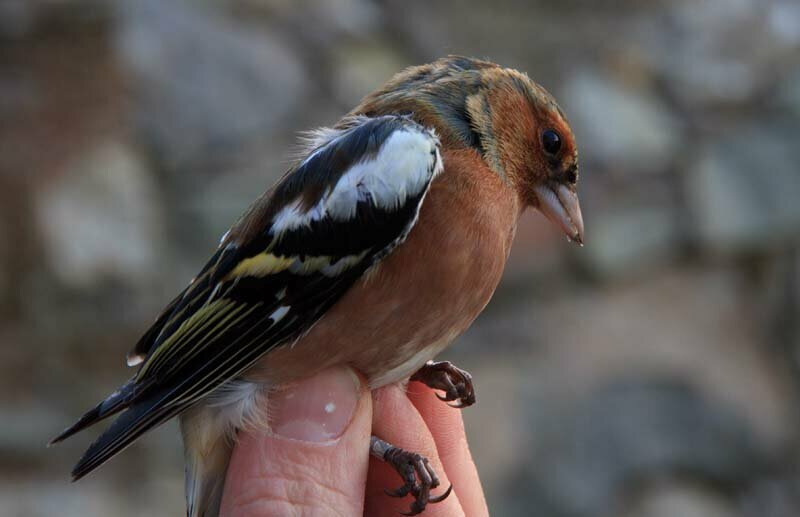 And a bit of a surprise, 1 male Chaffinch. We don't see too many Chaffinches here in Shetland, although we did see a pair at Sandness just last Thursday, so it was great to get one in the net in our garden.